ONE 4 ALL is the perfect year-round solution for your Diesel Engine. It is also the perfect follow up to Injector Pro Clean and highly recommended. In today's world of Ultra Low Sulphur Diesel Fuel, adding LUBRICITY is a must to prevent premature injector and injection pump failure. 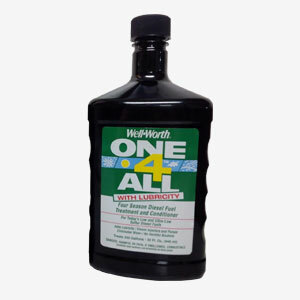 ONE 4 ALL is an ALL SEASON, Organic Based Product formulated to Add LUBRICITY to Low and Ultra-Low Sulphur Fuels. 1-32oz bottle will treat 250 gallons. If you have obvious Injector Issues, Treat with INJECTOR PRO CLEAN, and follow up with ONE 4 ALL for Incredible Results!